How We Discovered This Book: This book has been on my “To Read” list for a while. I believe Joanna recommended it to me. We borrowed it from our library. Captain Cur’s parrot dies, and his monocle is stepped on. How can he be a proper pirate captain without them? His crew finds him a replacement parrot, who is really a stuffed girl teddy bear. The crew teaches her to be a proper pirate, who bites, spits, swashbuckles, and perches on the captain’s shoulder. But she proves she’s really a proper pirate when they encounter another pirate ship and she saves the day. This book is funny, and is immensely fun to read aloud. My kids thought my teddy bear and pirate voices were hilarious. Who doesn’t love to do a good pirate voice? Both of my kids enjoyed the story. My son liked that it was different from other pirate stories. He thought the funniest parts were when the bear talked and tried to be a pirate. In simplest terms, TEDDY BEAR + PIRATES + HUMOR = GOOD STORY in our house. In searching for resources related to this book, I discovered that the mascot for the Pittsburgh Pirates major league baseball team is called the Pirate Parrot. Go figure. Declare it Pirate Day in your house: Dress up like pirates (a scarf, a striped shirt, a belt, and a quick paper eye patch will do), talk like pirates, and use your imagination to turn your couch into a pirate ship set for plunder. Whether it’s Talk Like a Pirate Day (September 19th) or not, you can always integrate pirate-based lessons into your classroom. This entry was posted in Book Reviews, Katie, Picture Books and tagged Jim McFarland, Lyn Rossiter McFarland, parrots, pirates, PPBF. Bookmark the permalink. Sounds like a very entertaining story. Am not familiar with the book. Thanks for sharing! Pirates have been on my mind of late – I’ll have to check this out. And I might declare a Pirate Day too! What a great twist, it does sound a bundle of fun! I LOVE this book, Katie! I’m glad you reviewed it to bring it to more people’s attention! I love it so much that I thought I had posted it for PPBF myself… but now I can’t remember… maybe I only thought about it… and the list is so hopelessly out of date 🙂 Anyway, I’m really glad you posted it, and also glad to find another fan of the book! Ar-r-rgh matey! 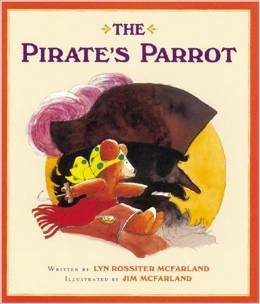 what fun… my kids always loved books about pirates whether they were humans or cats or parrots. I love the idea of a teddy bear.